This 31-slide presentation provides you with a thorough investigation into the mystery of solving context clues. Students will aid the investigator in learning what a context clue is, how to read around the difficult word to conclude its meaning, and then practice what they have learned through many guided examples and test prep examples. You will find difficult enough vocabulary words to engage even your highest students. 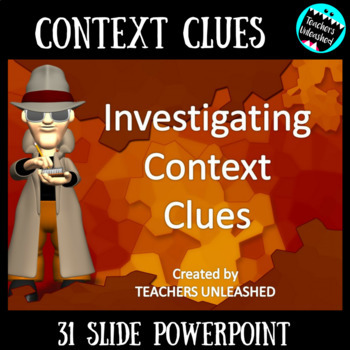 There is ample practice to master the standard of using context clues, and students will become honorary detectives when having completed the PowerPoint presentation. Go to your "My Purchases" page. Next to each purchase, you'll see a "Provide Feedback" button. Simply click it and you will be taken to a page where you can give a quick rating and leave a short comment for the product. Each time you give feedback, TPT gives you feedback credits that you may use to lower the cost of your future purchases. We'd really love it if you'd rate our item after downloading! Feedback is so VERY important! Click on the green star next to our store logo to receive upcoming sales, freebie and product launches, and email updates! Here's to a successful year!